Northallerton remain unbeaten and overcome Ensian efforts. Northallerton were jubilant and rather relieved, ‘Ensians were disappointed but philosophical. Top-of-the Table have beaten second- placed twice in the season and the overall stats brook no argument. The surface stood up pretty well, but a cold, dark, windy afternoon and a big set of home forwards determined to preserve their Club’s unblemished record, made for a hard, attritional match. Two tries to none proved the point for Northallerton’s pack as both came from periods of intense pressure imposed in the visitors’ 22. No recriminations there; the two “must come away with points” scores were inevitable and ultimately match-winning. The wind, diagonally corner to corner, made things difficult for the threes, both sets having opportunities for tries. Handling errors and good defences frustrated several clear-cut chances, although a lovely break by Luke Cowdell in the first half failed as the support play was not quite “on the shoulder”.The try-saving tackle was conclusive. In the second half the same player was called back from touching down under the posts, the referee ruling that illegal progress had been made after being properly tackled. - Ifs, buts and maybes! ‘Ensians opened the scoring with a Carl Paterson penalty after only a couple of minutes, but Northallerton replied almost immediately with the first of their forwards’ 5-pointers. A penalty kick into the corner and a driving maul was a modern classic riposte. A penalty goal then put the home side further in front, but this was cut back by an ‘Esian penalty, again from Paterson, who was also prominent with his kicking out of hand. 8-6 to the league leaders after half an hour, but this changed hands after Paterson’s third success made it 9-8 to ‘Ensians and this really was tight. Neither side was giving much away, although the visitors did have a brief spell of falling off tackles and making the home backs look dangerous. Half time came with a scoreline of 11-9 to Northallerton after another penalty, but ‘Ensians would not be dissatisfied, having played the half into the worst of the windy conditions and coping with a 10 minute yellow card. As is so often the case, only the second of the two miscreants was punished, but the ensuing “all in together” melee was brief and well handled by the official. It was, after all, a cup-tie sort of contest. The second half was certainly not spectacular; the visitors tightened their tackling and indeed had much of it to do. Equally, Northallerton’s defence was very good and the ‘Ensians backs were not able to find too much space. Perhaps the inside ball was overplayed a little and Eaves and Bateman were unable to make their customary clean headway. Alex Murphy’s move to centre merits further time, the more so with Paterson fulfilling the kicking role at full back. The middle channel of the field was well policed by both teams, Sam Featherstone showed up as usual in the line out and a ruckus here and there kept things warm. It is not always easy to follow the substitutions, but the forwards played well as a unit and “gave way” just the twice to a bigger, heavier pack, whose anticipated late tiredness did not really materialise. A long penalty attempt by Paterson fell just short and an equally long kick from hand rolled agonisingly long, with ‘Ensians having to come all the way back to the point-of-kick for a Northallerton scrum. The home side’s second try came midway into the half and, going through the phases well, they eventually went over. The scoreboard then stayed at 16-9 and you would have to acknowledge the home team’s ability to maintain the differential. The rest of this season and possibilities for next for these two clubs? Today’s conditions were not by any means ideal for such rumination, but the intent and aspiration are definitely there and good wishes to both are unequivocal. With a squad of 25 midweek with some star names on the team list, coach Harrison & team manager tempo were smiling ear to ear knowing it was going to be a tough fixture ahead. By Saturday though it had shrunk to 18. Mick groves went to 1st team duties, men stuck at work, alex bayfield – cardboard hamstrings & rob lyon [ wife wouldn’t let him play ! ] to mention a few. Tempo then spent 3 days trying to get a simple yes or no answer out of chris booth, which arrived at 10.59 on Saturday morning [ the pleasures of kindergarten chris! ]. The mature [ creaking ] front row had a combined age of 180 with boothy, wheely, & ray drake. The Tenniswood twins filled the 2nd row with a mobile backrow of ben smith, alex beckets & dan ridgeway. No1. Son fiery joe was at 9 with kool Kristian at 10. Dom oddy was at 12 with daz cooley putting the 13 shirt on again, before going on holiday [ his wife had packed him a case full of clothes? ? ] joe tindal & ryan lowe played wings while fenton forrest Parkinson[ just one person ] put the fullback shirt on. The bench was ollie Gibson & paul tosney. Big eddy made a return after life threatening injuries were mended, so the air ambulance hovered above the pitch until he made it to the showers safely. The ref for the day was technically correct but very frustrating. – fiery joe [ not a heat rub ] was penalised for standing up in the scrum [ technically correct ] marched back 10 for arguing [ technically correct ] apart from he was the scrum half ??. Harrogate Pirates had a big set of boys in the pack, with another set of big boys on the touch line to bring on. The game plan was to move them around on the wide but soft pitch. Pirates started on the attack with the big boys coming round the corner, but any opportunity to steel was taken up by the backrow who were in their quick, but were getting penalised for it ? from a strong Pirates scrum, the standoff went blind & the big centre went in at the corner, with Ensians defence going to high on him & it was 5 – 0 with 8 minutes on the clock. From the kickoff, Ensians attacked Pirates & old hand wheely stole the ball, & after a penalty was kicked to the corner, Ensians drove over with dan ridgeway touching down [ no one dare take it off him ! ] to make it 5 apiece. Matty pulled a fetlock while kicking, so while he got treatment, biggggg eddy made his first appearance , with the ambulance & first responder on high alert, & helicopter overhead, eddy made his way on to the pitch to cover for matty. The scrums were hard work, but bret and ben were holding their own in the lineouts. Kristian was using dom & daz to make good yards with fenton attacking from deep till he pulled a fetlock [ cardboard hamstrings ]. After a couple of penalties & ten minutes of playing advantage, Pirates took the 3 points on offer to make it 8 – 5, just before half time. Early in the second half, Pirates scored a good try using their big centre to break the line to make it 15 – 5, but with Ensians putting some good phases of play together, with dom & alex making good breaks, it wasn’t long before joe powered through to score & it was 15 – 12 with matty converting. Big eddy had some good runs while everyone held their breath, along with wheely, matty & dan. Ben smith was making yards through the middle, with Kristian kicking Harrogate back. 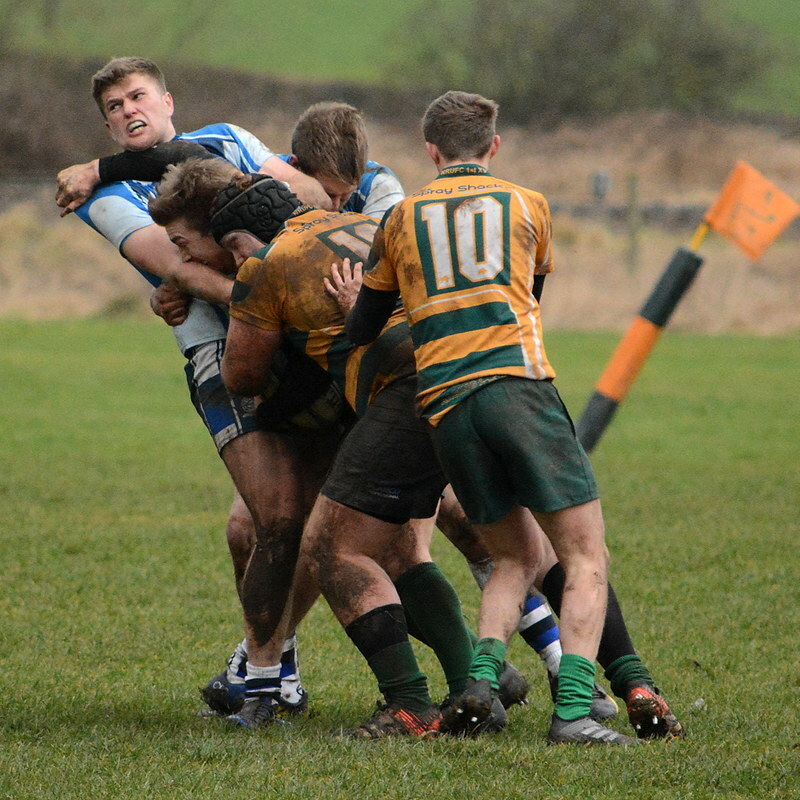 From a scrum, dan went blind, joe bounced the winger & set off up the field, the ball was spun across the backs for the best move of the match but Ensians didn’t score, which would of put them in the driving seat. The game then got scruffy, with a Pirates player getting carded for blatant off side, fiery joe got carded for retaliating after been taken out late constantly by the backrow, then after Pirates blatantly knocked on to stop a try, keiny got yellowed for quoting the bible ! with a backs reshuffle & Harrogate lending Ensians a prop with ray drake off [ who played fantastic ] Pirates 10 chipped the defence & caught joe napping at fullback to go under the posts. A late try sealed the win for Pirates with Ensians returning home to lick their wounds. A frustrating game to watch never mind play in, with injuries not helping, with the score not really giving a true reflection, but the scoreboard doesn’t lie.